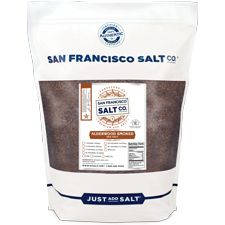 Smoked Alderwood Sea Salt is created by slowing smoking Pacific Ocean Sea Salt above a Northwest Red Alderwood fire. This centuries old process yields a rich, complex tasting sea salt without harshness or bitterness. 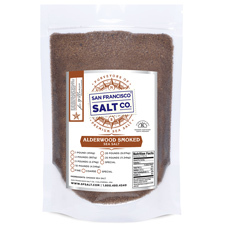 Smoked Alderwood Salt's authentic, clean smoke flavor makes it the perfect go-to salt when you really want to impress guests or simply want to enjoy a distinctive meal at home! Our Fine Grain is the preferred choice for sprinkling directly on to food/cooking! DESCRIPTION - Alderwood Smoked Sea Salt is made with pure Pacific Ocean Sea Salt that has been slowly smoked above an Alderwood fire. Packaged in our U.S.A., SQF Quality code compliant facility.